เนื่องจากสเตรปโตมัยซินนั้นแยกได้จากเชื้อจุลินทรีย์ในตัวอย่างดินที่ได้มาจากรัฐนิวเจอร์ซีย์ ทำให้ S. griseus ซึ่งเป็นแบคทีเรียที่มาของสเตรปโตมัยซิน ได้รับการเสนอให้เป็นเชื้อจุลินทรีย์สัญลักษณ์ของรัฐนิวเจอร์ซีย์อย่างเป็นทางการ โดยร่างกฎหมายนี้ได้รับการส่งเข้าวาระการประชุมโดยวุฒิสภา แซม ธอมพ์สัน (Senator Sam Thompson) (R-12) ในเดือนพฤษภาคม ค.ศ. 2017 ในวาระการประชุมที่ S3190 และสมาชิกสภาผู้แทนราษฎร แอนเนตต์ ควิจาโน (Annette Quijano) (D-20) ในเดือนมิถุนายน ค.ศ. 2017 ในวาระการประชุมที่ A31900. ↑ 2.0 2.1 2.2 2.3 2.4 2.5 2.6 2.7 2.8 "Streptomycin Sulfate". The American Society of Health-System Pharmacists. Archived from the original on 20 December 2016. สืบค้นเมื่อ 8 December 2016. ↑ 3.0 3.1 3.2 3.3 3.4 3.5 WHO Model Formulary 2008 (PDF). World Health Organization. 2009. pp. 136, 144, 609. ISBN 9789241547659. Archived (PDF) from the original on 13 December 2016. สืบค้นเมื่อ 8 December 2016. ↑ Torok, Estee; Moran, Ed; Cooke, Fiona (2009). Oxford Handbook of Infectious Diseases and Microbiology (in อังกฤษ). OUP Oxford. p. Chapter 2. ISBN 9780191039621. Archived from the original on 2017-09-08. ↑ Renneberg, Reinhard; Demain, Arnold L. (2008). Biotechnology for Beginners (in อังกฤษ). Elsevier. p. 103. ISBN 9780123735812. Archived from the original on 2017-09-10. ↑ "WHO Model List of Essential Medicines (19th List)" (PDF). World Health Organization. April 2015. Archived (PDF) from the original on 13 December 2016. สืบค้นเมื่อ 8 December 2016. ↑ "Streptomycin Sulfate". International Drug Price Indicator Guide. สืบค้นเมื่อ 8 December 2016. ↑ Hamilton, Richart (2015). Tarascon Pocket Pharmacopoeia 2015 Deluxe Lab-Coat Edition. Jones & Bartlett Learning. p. 36. ISBN 9781284057560. ↑ Raymon, Lionel P. (2011). COMLEX Level 1 Pharmacology Lecture Notes. Miami, FL: Kaplan, Inc. p. 181. CM4024K. ↑ Voet, Donald & Voet, Judith G. (2004). Biochemistry (3rd ed.). John Wiley & Sons. p. 1341. ISBN 0-471-19350-X. ↑ Jan-Thorsten Schantz; Kee-Woei Ng (2004). A manual for primary human cell culture. World Scientific. p. 89. ↑ Comroe JH Jr (1978). "Pay dirt: the story of streptomycin. Part I: from Waksman to Waksman". American Review of Respiratory Disease. 117 (4): 773–781. PMID 417651. ↑ Kingston W (July 2004). "Streptomycin, Schatz v. Waksman, and the balance of credit for discovery". J Hist Med Allied Sci. 59 (3): 441–62. doi:10.1093/jhmas/jrh091. PMID 15270337. ↑ Official list of Nobel Prize Laureates in Medicine Archived 2017-06-09 at the Wayback Machine. ↑ Wainwright, M. (1990). Miracle Cure: The Story of Penicillin and the Golden Age of Antibiotics. Blackwell. ISBN 9780631164920. Archived from the original on 2017-09-10. สืบค้นเมื่อ 2014-12-29. ↑ Wainwright, M. (1991). 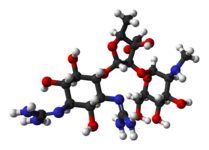 "Streptomycin: discovery and resultant controversy". Journal of the History and Philosophy of the Life Sciences. 13: 97–124. ↑ Kingston, William (2004-07-01). "Streptomycin, Schatz v. Waksman, and the balance of credit for discovery". Journal of the History of Medicine and Allied Sciences. 59 (3): 441–462. doi:10.1093/jhmas/jrh091. ISSN 0022-5045. PMID 15270337. ↑ Pringle, Peter (2012). Experiment Eleven: Dark Secrets Behind the Discovery of a Wonder Drug. New York: Walker & Company. ISBN 978-1620401989. ↑ ""Losing the War" by Lee Sandlin". Leesandlin.com. สืบค้นเมื่อ 2010-06-17. ↑ Dole, B. One Soldier's Story, pp. 202–04. ↑ Cramer, Richard Ben, What It Takes (New York, 1992), pp. 110-11. ↑ Metcalfe NH (February 2011). "Sir Geoffrey Marshall (1887-1982) : respiratory physician, catalyst for anaesthesia development, doctor to both Prime Minister and King, and World War I Barge Commander". J Med Biogr. 19 (1): 10–4. doi:10.1258/jmb.2010.010019. PMID 21350072. ↑ D'Arcy Hart P (August 1999). "A change in scientific approach: from alternation to randomised allocation in clinical trials in the 1940s". British Medical Journal. 319 (7209): 572–3. doi:10.1136/bmj.319.7209.572. PMC 1116443. PMID 10463905. ↑ "New Jersey S3190 | 2016-2017 | Regular Session". LegiScan (in อังกฤษ). สืบค้นเมื่อ 2017-11-29. ↑ "New Jersey A4900 | 2016-2017 | Regular Session". LegiScan (in อังกฤษ). สืบค้นเมื่อ 2017-11-29. Kingston, William (2004). "Streptomycin, Schatz v. Waksman, and the Balance of Credit for Discovery". Journal of the History of Medicine and Allied Sciences. 59 (3): 441–462. doi:10.1093/jhmas/jrh091. PMID 15270337. Mistiaen, Veronique (2 November 2002). "Time, and the great healer". The Guardian. . The history behind the discovery of streptomycin. EPA R.E.D. Facts sheet on use of streptomycin as a pesticide. หน้านี้แก้ไขล่าสุดเมื่อวันที่ 11 มกราคม 2561 เวลา 21:28 น.